With over 10 million customers, Netflix is a huge player in the online DVD rental business in the United States. Aside from sending out DVDs by mail, customers can also stream movies directly to a wide variety of devices. Despite these services, there are still plenty of people who cancel their accounts. 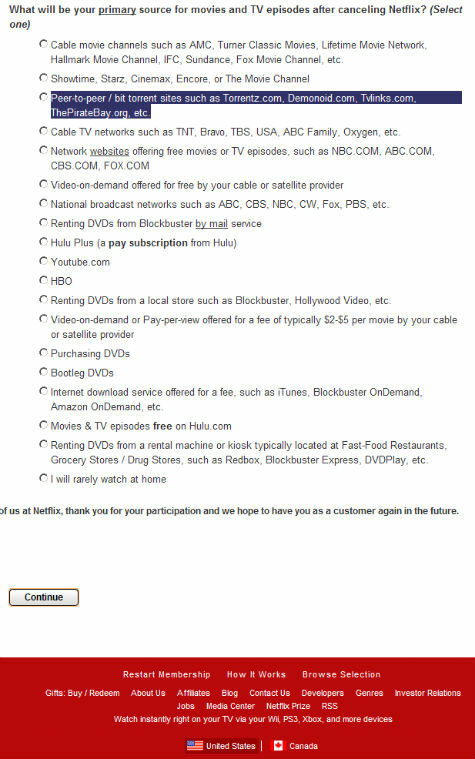 Just for the record, Netflix wants to know through a survey if they are perhaps 'pirates'. Hollywood often blames BitTorrent sites and other file-sharing platform for billions of dollars of annual lost revenue. Perhaps unsurprisingly, this alleged hit is not felt in all sectors of the movie industry. Netflix, the leading online DVD rental company in the United States, is doing very well. Despite a direct ‘threat’ from piracy, including many BitTorrent sites, Netflix’s revenue has been growing steadily year after year. In 2006 the company acquired a net income of $49.1 million, which more than doubled to $116 million by 2009. And this growth is not slowing down either. During the second quarter of this year Netflix booked a record-breaking income of $43.5 million. Although business has been going well for the movie rental company, there will always be customers who decide to cancel their accounts. In common with all self respecting companies, Netflix want to find out why people cancel, and this is the reason why they present leaving customers with an interesting survey. In the survey, Netflix asks for the reasons why the customer has chosen to leave, the likelihood that he or she will return and what their primary sources for TV-shows and movies will be in the future. “What will be your primary source for movies and TV episodes after canceling Netflix?” the question reads. Although this question in itself is nothing out of the ordinary, one of the response options is. Apparently Netflix sees BitTorrent sites as direct competition, and it fears that this may cause some customers to leave. “Peer-to-peer / bit torrent sites such as Torrentz.com, Demonoid.com, Tvlinks.com, ThePirateBay.org, etc,” is one of the answers that customers can check (see below). If chosen, the option does not trigger any follow-up questions related to BitTorrent, so the information they gather is not very elaborate. It would be interesting, however, to see how canceling subscribers answer the question above. How many would pick the peer-to-peer option? Perhaps more importantly, how is this information going to change Netflix’s business strategy?